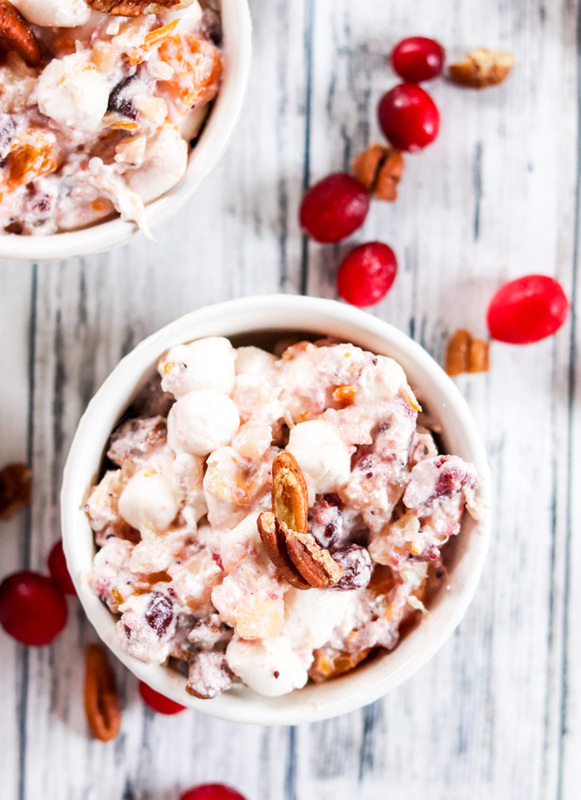 We took a traditional side dish and turned it into the best Christmas Holiday Ambrosia Salad. Loaded with cranberries, pecans, mandarin oranges and more. A holiday favorite! Today is the final day of our fantastic holiday side dish recipes week. The bloggers this week have shared some incredible recipes, something for every table. 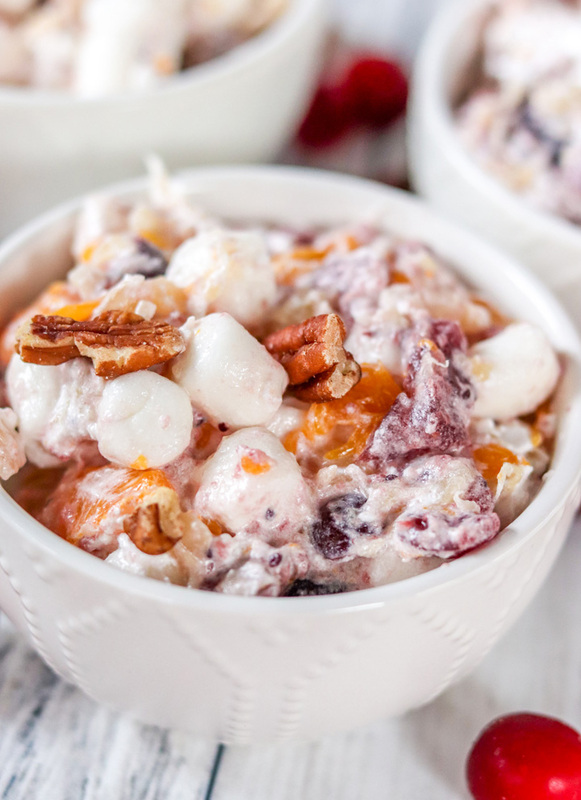 This week I have shared Easy Cheesy Creamed Spinach, Sweet Skillet Cornbread, Best Easy Homemade Stove Top Stuffing and today, this fabulous Christmas Holiday Ambrosia Salad. Christmas Holiday Ambrosia Salad is a twist on a traditional classic ambrosia salad, made special for the holidays. Because… why not? It is perfect for Thanksgiving or Christmas, and any time in between. It’s also good, just because. It tastes more like dessert than a side dish, but we don’t complain. It’s delicious! Don’t be afraid to add more of what you love in this dish, too. 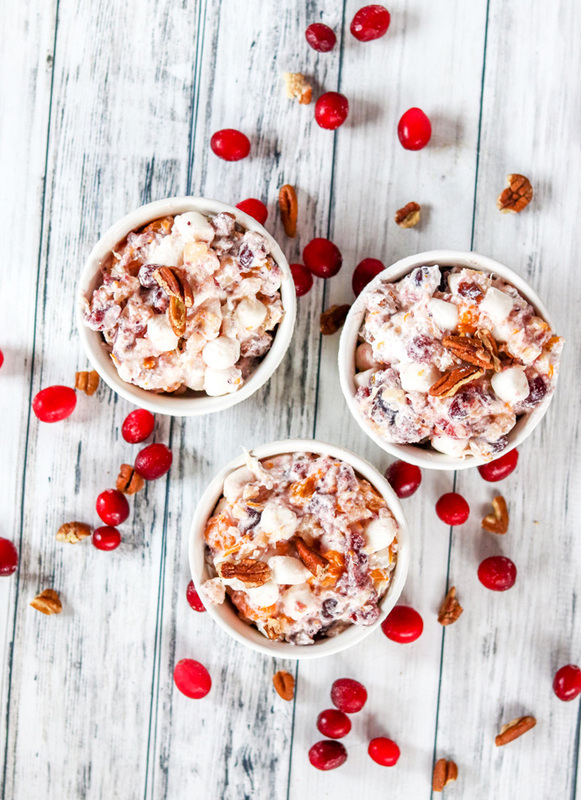 We like to add extra thawed frozen cranberries, coconut, and other additions that make this Christmas Holiday Ambrosia Salad a little different each time. Make your own whipped cream or use store-bought. When we make our own, which we love to do, we change up the extracts involved. Instead of Vanilla extract, we might use Almond or even Rum. You can really change up the flavors of this yummy Christmas Holiday Ambrosia Salad by changing what you put in it.